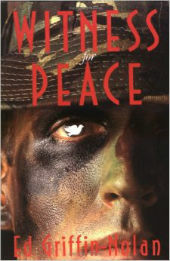 In this graphic, thought-provoking book, Ed Griffin-Nolan depicts the experiences of Witness for Peace (WFP), a group of Americans who bore witness to the war in Nicaragua – an event that resulted in the killing and wounding of many innocent Central American civilians. Griffin-Nolan explains how WFP participants spent weeks in the war zones in order to understand the impact of U.S. policy on simple people living, as one member of the group phrased it, “at the end of a gun barrel.” He describes how WFP participants labored to bring stories of war back to the United States, and how many of them lost their jobs and even their marriages in the process. He concludes by showing that the efforts of WFP saved lives and possibly prevented “another Vietnam” from developing in Central America.